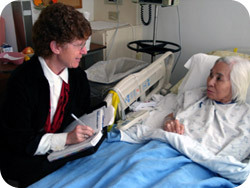 Barbara has been the Writer in Residence since 1999; two years after a near fatal head-on collision brought her to Alachua General Hospital. She believes that an essential part of her recovery was not only the incredible doctors and staff in the hospital but her friends, her community and the artists in Arts in Medicine who saw her as a person who still had a full creative life, not just as “the car accident in 461”. Now she is the Writer in Residence doing oral histories with patients as a way to remind them of what a full important life they have had and to honor them in this way, giving back to patients what people did for her. 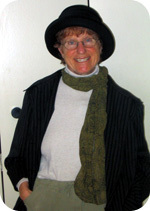 Before Barbara was in Arts in Medicine, she was a traveler, a midwife and a psychiatric nurse for many years, has a degree in cultural anthropology, and is a published writer. She believes her love and interest in people’s lives has reached a joyful culmination, integrating all these parts in Arts in Medicine.